What to do if audio materials are rare or non-existent? Today’s article is a continuation of the topic we started yesterday, namely the use of listening at graded speeds in order to improve our listening fluency. There are two times during a large linguistic project when I recommend the use of audio-only all audio-primary approaches. The first of these is right at the beginning, in order to make sure that when we do open the books and start reading words and writing them out in our Goldlists, we already have an idea hhow the language sounds and how these words and phrases are pronounced. If we take a course such as Michel Thomas series, Pimsleur, Paul Noble, Innovative Language Learning, or something else of that kind, we equip ourselves with all that we need to end into a Goldlist project of possibly 100, 200, 500 etc hours having done our first maybe 50 hours of language learning without setting pen to paper, and without really reading anything much in the given language. I’m convinced that this is a natural approach – after all, little kids get to listen before they ever get to read and write, we learned our native language that way. At least in that order. Of course, babies get to listen for thousands and thousands of hours of speech before they develop the skills that we can develop in a more structured way, we would want to return to the experience of a newborn in the course of our language learning. Such a “Nicodemus Method”, would have certain drawbacks in terms of cost and also patience on the part of the host family. However it is entirely unnecessary, since in most cases 50 hours of audio time at the outset is really all you need in order to progress confidently with the reading-and-writing approach that the Goldlist Method is, as long as you have access to quality materials. These materials need to be some kind of structured course, whereas when you get to the end of the language project on Goldlist and you’re looking at the second time in which I’m recommending using audio-primary materials, namely to induce listening fluency based on an existing passive vocabulary, then you don’t really need to have materials in a structured course. As I said yesterday, you need to have a book – which may be a novel, a business book, a history book, a Christian book – even the Bible. In the best situation you will be choosing a book which exists in your target language as the original, especially If we are talking about something like a novel or some other cultural artefact. I don’t really recommend poetry in most cases this, not at the outset in any case. Poetry is something to graduate to only at the truly advanced level of command of a foreign language on pain of simply sabotaging your chance to appreciate the fullness of the verse by becoming familiar with it when you do not yet have the apparatus to appreciate it. don’t get me wrong there certainly is a place for using poetry but I think here it would be wise to look at the range of poems available very carefully and to grade you’re reading so that first reading poets who use a language which is more similar to everyday speech. And by that I mean standard everyday speech. I am not recommending for example learners of English to kick-off with James Joyce’s Ulysses, even though there are some excellent recordings of that and some excellent translations into other languages. This is a novel which requires careful study even from native speakers, although that having been said, I did have the pleasure of being acquainted with the person who translated Finnegan’s Wake into Brazilian Portuguese, and that was a Russian lady from Harbin, believe it or not. Such genii are few and far between, but I like to think that in as much as they are out there, they do read my things, and therefore I would want to put you off ploughing straight into poetry if that’s your thing, however most of us I would go prose first, then drama, then poetry. So at this stage you need to select your book, being one in clear language of the sort that you would like to understood when it is spoken and let’s say that you found an accurate translation into your own language. If that’s not possible and you have to take a book which is either in its original in your language or where the original is in a third language and you’re dealing with translations into both your own language and the language you’re learning, then even though that is not normally the best thing to do, there are circumstances where it’s actually preferable – for instance if you’re setting out to become familiar with the Bible in the language of your study, or if you are going to be working in a field which is simply more developed in your native language and therefore the originals are all in your language but there are good translations into the study of language. Because you have a utility from simply reading a better book, there are times when it becomes preferable to accept that the translation should be in the learned language. Then there is also Glossika Method, named for Mike Campbell, in which he simply uses his own favourite English-language novels which he knows so well he could almost recite them verbatim from memory, and he collect them in a language as he wishes to study and simply reads them. Personally I would be bored by such an approach as I like a larger variety of reading, and to get into the particular literature and culture of the country concerned. In this I have exactly the same view as Steve Kaufman who also has been doing videos about this topic recently. Nevertheless, I can see that a certain languages you simply could run up against a lack of the preferred materials, and then you really have to see what there is and try to adapt that. My suggestion is, to look first at what’s available as an audio book in the language of your choice. That’s where the bottleneck is likely to be, if there is a bottleneck. 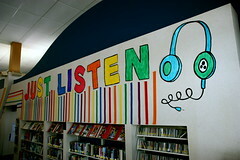 You can look up audio books in different languages using Google. You can refer to the Wikipedia article about audio books written in the language you are studying. Even if you’re not sure how to say audio book in the language you are studying you can go to the English Wikipedia article about them and then choose one of the 36 other languages which at the time of writing this article is being translated into – hopefully this may include the language you’re looking for. Quite a few languages mirroring that article do contain very helpful Web links to repositories of audio books, including free ones. My first port of call is always to check Audible, but in cases where audible doesn’t have audio for the language concerned, there is still Amazon. Amazon sells audio on physical media while its subsidiary Audible has its own format which as I said in the above article is a very helpful format for our purposes. Audible itself contains quite a lot of novels read in the original in such languages as Spanish, Italian and Russian, and there are also French and German entire sites of Audible. Still it is a problem when we come to a minority languages, but still I would always check there first. If googling the net in search of novels or other books which are read out in an audio format in the language of your choice does draw a blank, your next option is to select the book of your choice where there is both language versions and where you are motivated to read it in the language you are studying. Once you have selected it and determined that there is no audio version available, you have various options as to how to obtain the audio. There are cases where the author himself might be willing to go to the studio with you and produce the audio version. In many cases that will be a question to settle with his publisher. This might sound as though you’re getting into quite sizeable cash investments in order to get your audio, but you might be surprised at what can be achieved simply by asking people and giving them ideas, showing that there is demand, and being willing to volunteer at least some corporation and work on the project even if you cannot put cash into it. Failing the ability to obtain official audio in the way mentioned above, the means of last resort is simply to get friends to read it. If you are not in the country where the language is spoken then there is one more idea and that is to go to the Embassy (if it’s a national language) and ask to talk to the cultural attache and see if the Embassy is able to help you put such a project together. in the case of the audio that you need right at the beginning, just going back to that topic before we close, usually there is not such an issue with this given that there tends to be a lot of beginners courses, and if you can’t find one which is pure audio in the Pimsleur mould then there are always the likes of Teach Yourself and Colloquial. This means that you’d be doing the audio while already Goldlisting a course, which is of course not ideal, but in these cases – I’m talking about languages like Maltese or Bulgarian which don’t even have a Pimsleur (Pimsleur does about 50 languages – not all at the full 30 lessons it seems – but Maltese, Welsh, Bulgarian and some other surprising ones are not covered when two separate forms of Armenian and languages like Twi and Ojibwe or Swiss German are) – you can either look on their local market and their bookshops if you go there, or try internet bookstores if they have them, or it’s a question of abandoning the audio-only 30 hours at the start of a whole new language and then it’s Goldlisting from the word Go. I’m grateful for this question. It surely affects most learners at some stage – especially when learning a language for the first time, or doing it on your own for the first time/taking it seriously for the first time, as opposed to school learning. It’s not really a question of time but of the presence of certain ingredients in your brain. If you have done at some stage a Pimsleur or some audio course so that you know what the words and phrases you are goldlisting are supposed to sound like in a pretty standard version of the language you are learning, and you have goldlisted about 10,000 words or more and taken them through to the end of silver if not gold levels, then you can do the following activity with a much higher assurance of success. You need to get hold of an audio book for a book you can read in that language, and where there is a translation in English. The best place for this is Audible, where the app allows you also graded speeds of listening to the same material – and you can start off with a slower speed and build up. Listen to the same piece of 10 minutes long with short, ten minute breaks about three times over. This is not a long-term memory exercise it is an ear exercise and so you are perfectly OK using short-term memory techniques for this, they are quite appropriate. This is not the point at which you learn the words, you should have learned most of them before. This is where you push your ear and get it to go “aha”. Once you have done this, you are likely to find that some parts of the spoken text have become a tad clearer and some still baffle you. You then open the book and read the text, which you should not have done before this point. Having read the text, if there are any words that you do not know, please mark them and find them in the English text, please also make sure that anything you get from the English text which you didn’t get from the original – work out if that’s the fault of your lack of nuancing or too much freedom on the part of the translator. Add any missing knowledge back into your headlist and put it through the Goldlist system in due course. You then should read the text while listening to it at normal speed. You can do this a couple of times if you feel it needed. You should be able to speak along with the recording now, while reading the text. If this is hard at first, use the pause button and precede each recorded sentence with your own attempt. Then finally you can go back to just listening but use higher speeds, like 1,25 or 1,5* normal. You then move on to the next chunk of text, rinse and repeat. But every so often you go back and listen to what you heard before. Not only will this improve listening comprehension, but also accent. Nevertheless, it is not a way of learning to the long term memory, it’s an aural fitness routine. You therefore, like I said at the beginning, should only start to do this once you are really nearing your goldlist target. It is a way of getting to speaking fluency as well around the “listening” route described in my articles here on my Four Function Diagram. This activity will increase the time to fluency but you need to vary the voices you hear. In due course listening to DVDs in the language which have subtitles will be useful, and then gradually listening to news reports. Start with TV ones, and then move out to radio ones where you do not have the crutch of the image. Many thanks again for the question.